Blood donation is about donating blood; it does not affect the health of the person donating. Bloodletting is the practice of withdrawing blood from a patient to cure a disease. The practice was widely used in Antiquity and the Middle Ages. People stopped using it in the 19th century. The idea of bloodletting comes from an ancient system of medicine called Humorism: This system states, that there are different humors in the body. To remain healthy, a patient had to keep these humours in balance. 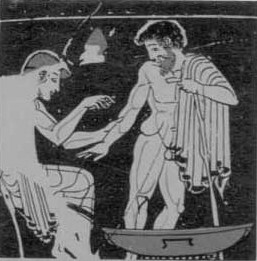 Bloodletting was the most common medical practice performed by physicians from antiquity until the late 19th century, a span of almost 2,000 years. It was found that only in very few cases, this treatment helps cure a disease. The practice has now been abandoned for all except a few very specific conditions. There was no other treatment for hypertension. Bloodletting could sometimes have had a beneficial effect in temporarily reducing blood pressure by reducing blood volume. The problem with hypertension is that it is difficult to diagonse from its symptoms. Modern methods directly measure blood pressure. In Antiquity, this effect was therefore unintentional. In most cases, the historical use of bloodletting was harmful to patients. The diseases where bloodletting actually helps include Polycythemia vera. In this disease, the number of red blood cells is increased, which changes the viscosity of the blood. Another disease is Polycythemia, which also leads to an increased number of red blood cells. ↑ "Bloodletting". British Science Museum. 2009. Retrieved 2009-07-12. ↑ Mestel, Rosie (6 August 2001). "Modern Bloodletting and Leeches". Los Angeles Times. Retrieved 2009-07-12. ↑ "Bloodletting Over the Centuries". Gilbert R. Seigworth, M.D. 1980. Retrieved 2009-07-12. ↑ "Why fair tests are needed". jameslindlibrary.org. 2009. Retrieved 2009-07-12. This page was last changed on 30 August 2017, at 22:08.